Fibrosing interstitial lung disease is the poor prognostic non-infectious lung disease by unknown etiology. Here, we present one case developing interstitial pneumonia with fibrosis after treatment of pneumocystis pneumonia (PCP) in newly diagnosed HIV-1 infected case. A previously healthy 63-year old male was referred to our institute because of protracted dyspnea on effort in 2 weeks after pneumocystis pneumonia treatment. At referral, arterial blood oxygen pressure was within normal range (93.5 mmHg) at rest, but decreased rapidly 30 s after a slow walk (44.5 mmHg). Respiratory function tests showed severe restrictive ventilator impairment (vital capacity = 36.5%; forced expiratory volume in 1 s = 107.4%). Chest computed tomography showed severe fibrotic changes at bilateral basal parts and diffuse fibrotic changes in which PCP lesions were seen initially in previous images although β-D glucan was not elevated and P. jirovecii was not detected in saliva at referral. Other etiologies of fibrotic IP including infectious and/or autoimmune diseases were excluded by serology. Fibrotic lesion did not expand thereafter although it had not responded to the high-dose corticosteroid therapy. 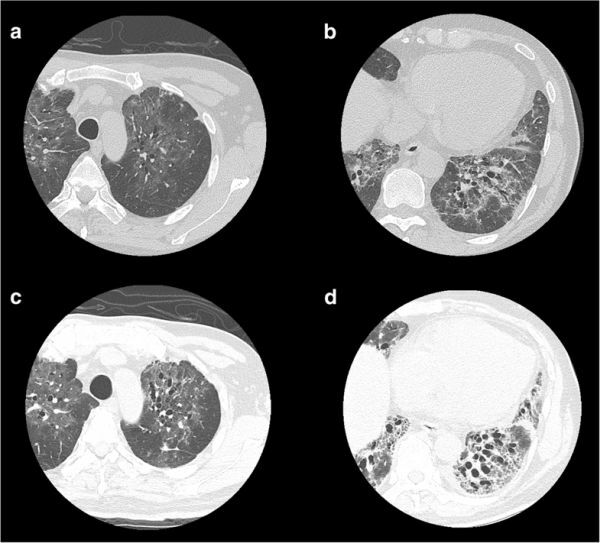 We report the first case of fibrosing interstitial lung disease triggered by HIV-related PCP.